How do you know if students are with you at the beginning, middle, and end of a lesson? Can formative assessment offer a key to better teaching and learning during instruction? What if you could blend different formative assessment moves in your classroom, with intention and care for all students, to help make better instructional decisions on the fly and enjoy more teachable moments? Each chapter explores a classroom-tested move, including foundational research, explaining how and when to best use it and describing what it looks like in practice. Highlights include case studies, try-now tasks, and tips and advice from beginning and seasoned teachers who use these formative assessment moves in their classrooms. 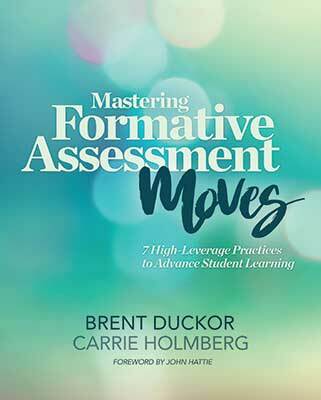 "In Mastering Formative Assessment Moves, Brent Duckor and Carrie Holmberg elaborate specific instructional moves to help both novice and seasoned teachers deepen their formative assessment practices. Their vision is not to be added on top of other reform initiatives but fits perfectly within equity-focused, ambitious teaching practices aimed at deeper learning. I like that the authors push back against quantitative indicators as the best means for tracking learning progress and offer ways, instead, for triangulating and building upon qualitative windows into student thinking." "For two full decades, formative assessment's prevalence in our schools has fallen far short of its proponents' predictions—particularly given the research evidence supporting its effectiveness. Drawing on their own experiences as practitioner-researchers, Duckor and Holmberg have come up with a marvelous set of implementable guidelines, for both prospective and seasoned teachers, showing how the formative-assessment process can sparkle." "The authors have performed a rare feat; they explain the 'why' of formative assessment at a high level, but Duckor and Holmberg also get into the nitty-gritty of actual classroom level practice. Educators, both new and experienced, will find much they can use here." Brent Duckor is an associate professor in the Department of Teacher Education at San José State University. Carrie Holmberg is a lecturer and preservice teacher educator at San José State University.